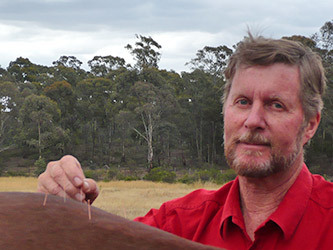 Dr Clark graduated as a vet from Melbourne University in 1974. After working in Warnambool, then Maryborough he established Castlemaine Veterinary Clinic in 1977. 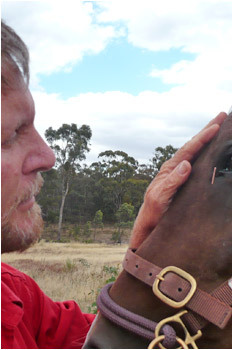 In 1994 he studied veterinary acupuncture at Australia’s second IVAS (International Veterinary Acupuncture Society) course. This study takes a full year and is only available to registered veterinary practitioners. After completing the course, passing written and practical exams and completing two scientific papers Dr Clark was accepted for certification by IVAS. He has since continued study and maintained that registration, and is also registered with the Acupuncture Group of the Australian Veterinary Association. Acupuncture became a rapidly increasing aspect of his practice. Dr Clark was taking referred patients from Bendigo, Ballarat, Melbourne and southern N.S.W. Partly due to this, but more due to the excellent success rate of cases treated with acupuncture, Dr Clark sold the Vet Clinic in 2011 in order to concentrate on acupuncture and equine vet work, and to be able to offer this excellent service to a much greater range of patients over a larger area of Central Victoria.